Reports within 24 hours & in most cases the same day. dollars on items which you may be able to have the seller or builder correct. Top 10 Home Buying Errors. 1) Failure to set a budget. 2) Picking the wrong mortgage. 3) Choosing a bad neighborhood. 4) Ignorance of what homes really cost. 5) Sticking with a bad real estate agent. 6) Never revisiting the neighborhood. 7) Failure to think about future resale issues. 8) Buying the nicest home on the block. 9) Not hiring a home inspection. 10) Not planning for closing costs. *Free re inspections are only valid in the Laredo area. & if inspection is paid within 24 hours of inspection. 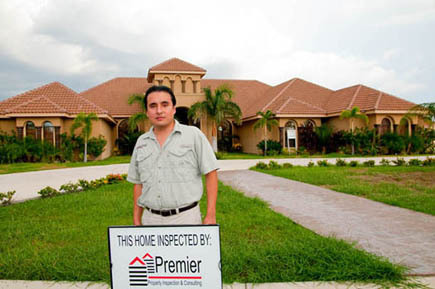 Property Inspections, Home Inspections, Home Inspector, Property Inspector, Building Inspections, Commercial Inspections, Laredo, Eagle Pass, Zapata, Webb County, Carrizo Springs, Hebbronville, Uvalde. and the Rest of South Texas. effort, your money's worth and more. Uvalde and the rest of Southwest Texas. New Homes - Reviews New home builder reviews - An independent website. The ultimate information tool for home buyers, homeowners and builders. standing click on the T.R.E.C. symbol below.